Jesus warned about wolves in sheep’s clothing in the seventh chapter of Matthew, but even He might be thrown for a loss by the wolf that made his way into several schools March 6 in Kansas. 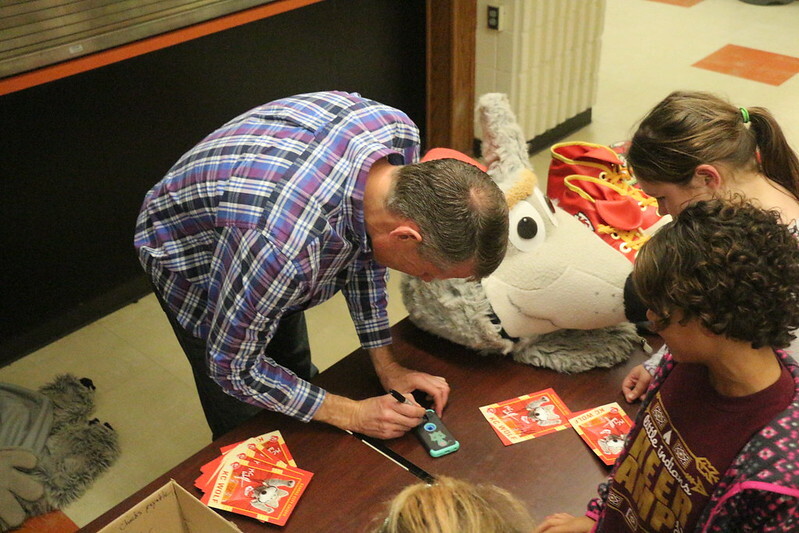 Dan Meers, who has played the Kansas City Chiefs mascot KC Wolf for the past 27 seasons, visited five schools in north-central Kansas for events sponsored by the United Methodist Men before speaking that night at the 68th annual Men & Boys Rally in Beloit High School. At nearly all of the schools – Beloit High, St. John’s/Tipton Catholic, NCK Technical College, Lakeside Junior/Senior High and Beloit Elementary – Meers made his entrance as his carnivorous alter ego, clowning around with the crowd. He then took off his wolf head and the suit that turns him into the Chiefs mascot, explaining how he got the job. He played Truman Tiger while a University of Missouri student, then played Fredbird for baseball’s St. Louis Cardinals for a year before the Chiefs position opened up. “I get paid to act goofy,” Meers, the first NFL entrant in the Mascot Hall of Fame, told his young audiences. Meers also shared his ABCs of Success – Attitude, Behavior and Character – and how they make a difference in his life. Although the Beloit rally has a 68-year history, for the past several years organizers have upped their game to include bigger draws to the general public by using sports figures from the area. In the five schools, Meers brought KC Wolf’s message to more than 1,300 young people in a day, said rally chair Kevin Marozas. “During the day it’s really something special that we do,” Marozas said. About 300 people attended the rally that night at Beloit High School. Billed in its early history as a “Mens Rally,” boys were added to the title several years ago, and signage through the years has changed to indicate that females were just as welcome as males to attend and hear from the speakers. Meers wasn’t wearing KC Wolf’s oversized head or costume when he spoke at the rally that night. He gave a similar presentation about his start as a mascot, his 23-year marriage and his three children. But he focused his talk that night about the accident that almost cut short his mascot career – and his life. While rehearsing for a stunt the day before a Chiefs-San Diego Chargers game in November 2013, Meers had planned a bungee jump off the lights at Arrowhead Stadium. The bungee cord that was supposed to lapse 20 feet instead stretched 75, and Meers landed in the stadium with such a force that two of the seats were knocked loose from the concrete. What was supposed to be “one of the greatest mascot entrances of all time,” Meers said, ended up with him hospitalized for nine days and off work for six months. Seven of his ribs were broken, his left lung collapsed, tailbone shattered, sacrum cracked, his left leg gashed and T-12 vertebrae were broken. That night in the hospital, his doctor told him he was lucky to be alive and lucky he wasn’t paralyzed. Now 50, the St. Charles, Missouri, native calls himself an “evangelist with fur,” making more than 250 appearances a year as KC Wolf and spreading the word of the healing power of a relationship with Jesus Christ. Meers said that when Christians get to heaven, there will be a party bigger than any tailgate and football game in the NFL. “I just hope parking’s less expensive there than it is in Arrowhead Stadium,” he joked.